Le Salon Sardine - chriskrauts Webseite! Le Salon Sardine is a nomadic monthly event Chris Kraut co-organizes with another Clown, Lili Waits. 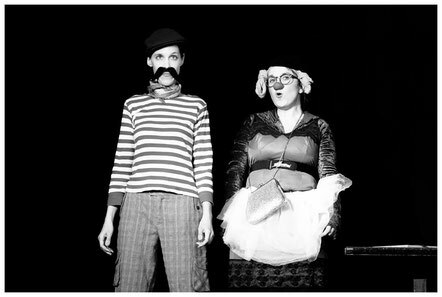 It is an open stage for new clowns, circus and other comic arts, and takes place in different locations in Vienna. Le Salon Sardine welcomes artists to try finished and half-finished numbers in front of our audience. Interested artists can contact us via Le Salon Sardine's e-mail or by contacting Chris Kraut directly. For dates, see Chris Kraut's upcoming events, our facebook page or our homepage.